Action Thrillers and Romantic Comedies abound on DramaFever in September – Hello Asia! Premiering on DramaFever this September are action thrillers and romantic comedies. Let’s Drink, is a romantic drama following the relationship between a rookie teacher and a seasoned civic service professor who fall in love after spending numerous nights drinking together and K2 is an action filled series starring South Korean singer and actress, Song Yoon Ah as the daughter of a presidential candidate who is seeking revenge on everyone that has wronged her. Viewers can also tune in for the finale of Uncontrollably Fond, a romantic comedy starring Miss A’s Bae Su Ji (Suzy), as an aspiring documentarian who reunites with a past lover who has become a megastar, and continue to follow one of DramaFever’s biggest hits of the year, Cinderella and Four Knights. Stars Ha Suk Jin and Park Ha Sun – This DramaFever exclusive dives deep into the romance of Jung Suk (Ha Suk Jin), a seasoned private school professor and Shin Ib (Park Ha Sun), an optimistic rookie school teacher. As they deal with everyday work pressures, they find joy in drinking together and discussing their personal lives and career. This romantic series also stars Hwang Woo Seul Hye, Gong Myung, SHINee’s Key, Min Jin Woong and Kim Won Hae. 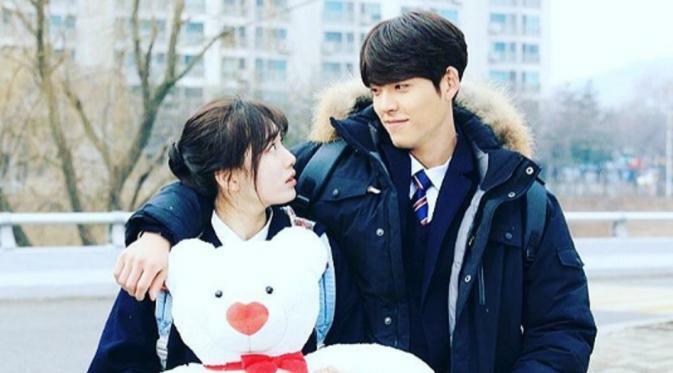 This DramaFever Exclusive stars South Korean Model Kim Woo Bin and K-Pop Singer Bae Su Ji (Suzy) – This romantic comedy follows two lovers after a bitter breakup that reunite years later as completely different people — one an egotistical superstar (Kim Woo Bin), and the other a materialistic documentarian (Suzy). This rom-comedy also stars Lim Ju Hwan, Lim Ju Eun, Yu Oh Seong, Jin Kyung, Jung Sun Kyung and Choi Moo Sung. Stars Ji Chang Wook and Song Yoon Ah – Kpop singer, Song Yoon Ah stars in this action-thriller as the daughter of a presidential candidate who teams up with a former secret service agent (Ji Chang Wook) to get revenge on those who wronged them. Stars Lee Joon Ki and Lee Ji Eun (IU) – This Chinese drama follows Hae Soo (IU) is a 21st century woman who gets caught in a solar eclipse and is transported to the Goryeo Dynasty. As Hae Soo begins to take on her new identity she meets Fourth Prince Wang So (Lee Joon Ki), a handsome royal bachelor who is dedicated to winning over her heart and taking his rightful place as king.The series also stars Lee Joon Ki, Lee Ji Eun (IU), Kang Ha Neul, Hong Jong Hyun, Byun Baek Hyun, Nam Joo Hyuk, Kim Ji Soo, Kim San Ho, Seo Joo Hyun (Seo Hyun), Kim Sung Kyun, Jo Min Ki, Yoon Sun Woo, Park Ji Young, Kang Han Na, Park Si Eun, Z.Hera, Jin Ki Joo and Sung Dong Il. Stars Jo Jung Suk and Gong Hyo Jin – This romantic comedy follows Jo Jung Suk as Lee Hwa Shin, a handsome TV anchor and notable journalist and Gong Hyo Jin as Pyo Na Ri, a fierce meteorologist who are competing to become the top TV news anchor at a well-known broadcast station. Although Lee Hwa Shin and Pyo Na Ri are complete opposites –one coming from a well to do family and the other from a working class upbringing – they slowly began to fall in love with each other. This rom-com also stars Go Kyung Pyo, Lee Mi Sook, Lee Sung Jae, Park Ji Young, Seo Eun Su, Mun Ka Young, Kim Jung Hyun, An Woo Yeon, Park Seo Young and Park Jung Soo. For more of the best drama and movies from Asia check out DramaFever!